Agency infighting and regulators' repeated disregard of shoddy lending practices allowed Washington Mutual Bank, a $300 billion thrift and the sixth largest U.S. depository institution before it failed in 2008, to continue to make high-risk mortgage loans and sell them as securities into the market, according to the findings of a Senate investigative subcommittee released Friday. In the second of four hearings being held on causes of the economic crisis by the Permanent Subcommittee on Investigations, Chairman Carl Levin (D-Mich.) called Seattle-based WaMu, which was purchased by JPMorgan Chase (JPM) in 2008 after it collapsed, "a case history to illustrate how from 2004 to 2008, U.S. financial institutions loaded up on risk and churned out hundreds of billions of dollars in high-risk, poor-quality home loans to Wall Street in exchange for big fees. Together they initiated the economic assault." The financial firms "couldn't have done what they did unless their regulators let them," Levin said, listing numerous examples of situations in which the Office of Thrift Supervision knew of serious problems in loan quality and risk management at WaMu, but did little to stop the practices until it was too late. The Federal Deposit Insurance Corp., the bank's back-up regulator, also did not take enough action to ensure the safety and soundness of the bank, Levin said. The subcommittee released nearly 500 pages of documents from regulators and WaMu, and it took testimony from inspector generals at Treasury and FDIC, both of which released their own critical reports. Bank Dumped Toxic Mortgages Into Market "Like Polluters Dumping Poison in a River"
WaMu was the largest financial institution overseen by the Office of Thrift Supervision, and WaMu's fees paid for 12% to 15% of the agency's budget, Levin said. "OTS was a feeble regulator," he said. "Instead of policing the economic assault, OTS was more of a spectator on the sidelines, a watchdog with no bite, noting problems and making recommendations but not acting to correct the flaws and the failures that it saw." At times, OTS officials even prevented the FDIC from fully examining the bank, he said. Between 2003 and 2008, WaMu and its primary subprime lender, Long Beach Mortgage Company, dumped low-risk 30-year fixed-rate loans and loaded up on more profitable, but problem-plagued, high-risk subprime and adjustable-rate "option arm" mortgages, Levin said. From 2000 to 2007, WaMu and Long Beach securitized at least $77 billion in subprime loans, stopping only when the subprime secondary market collapsed in September 2007. WaMu sold another $115 billion in option arm loans. "Together, WaMu and Long Beach dumped hundreds of billions of dollars of toxic mortgages into the financial system like polluters dumping poison in a river," he said. Meanwhile, regulators "had a front-row seat to Washington Mutual's high-risk lending strategy, its poor quality loans, its substandard securitization practices, but did little to stop it," he said. OTS was well aware of WaMu's high risk lending strategy, moving to require the bank to get board approval of that strategy in January, 2005. "OTS knew about WaMu's shoddy lending practices, having repeatedly identified problems with the bank's operations in examination reports year after year," Levin said. OTS noted numerous problems at WaMu and told the bank to take corrective action, but when problems were not fixed OTS failed to take action. Levin listed deficiencies noted by OTS examiners in WaMu's lending policies, including concentrations in option arm loans to higher-risk borrowers, limited-documentation loans, and loans with subprime or higher-risk characteristics throughout a period from 2004 through 2008. OTS raised concerns with WaMu's top executives and board of directors for five years, Levin said. "Each year, WaMu promised to do better, but it didn't, and OTS never took action to change that," he said. 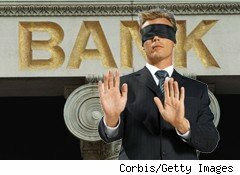 OTS officials viewed the bank as their "largest constituent" instead of an institution that they were supposed to regulate, he added. While some OTS examiners tried to object to policies that allowed borrowers to get loans without verifying income, an OTS official dismissed concerns, labeling one examiner who raised concerns as a "lone ranger." The agency did not take any enforcement action until shortly before the bank failed in 2008, when it was too late, Levin said. OTS examiners felt they could not take action against WaMu as long as the bank was not losing money and loans were being repaid, according to the subcommittee's findings. However, regulatory standards require agencies to take action against bad practices, whether or not the institution committing them is making money, Levin said. Moreover, OTS officials felt that as long as WaMu was selling the mortgages as securities, they did not need to interfere, regardless of their effect on the market or the broader economy. OTS officials also blocked FDIC access to bank data, Levin said. But the FDIC expressed concerns about the bank from 2005 through 2008, and did not act aggressively to correct the bank's practices, he said. The FDIC finally downgraded the WaMu in September 2008, after several runs on the bank's deposits, and the OTS reluctantly followed suit the same day. "By then, the FDIC was contemplating whether the $300 billion thrift, had it failed, might exhaust the entire federal deposit insurance fund, which contained a total of about $45 billion," he said. The OTS closed WaMu and appointed the FDIC as receiver in September; the FDIC sold WaMu's assets to JPMorgan Chase for about $1.9 billion. "This is a great example of regulatory failure," concluded Sen. Tom Coburn, (R-Okla.), the ranking GOP member of the subcommittee. But Congress was also remiss, he said. "Where was the Congress in looking at OTS?" Congress did little to oversee the effectiveness of OTS or the FDIC, he said, and he criticized plans for the Senate to consider financial reform legislation before getting a full report on what happened with bank failures. In prepared testimony, FDIC Chairman Sheila Bair claimed that the FDIC "has taken a leading role in addressing some of the unsustainable trends that precipitated the mortgage crisis." The agency has advocated for regulatory reform to end abusive mortgage lending under the Home Ownership and Equity Protection Act, she said. But she said an interagency agreement giving the FDIC back-up authority to examine high-risk thrifts limited direct FDIC access to bank employees and required it to rely on examinations conducted by the OTS. "The compromises that appeared reasonable in theory at the height of the banking industry profitability served to bind us when the FDIC needed to implement this agreement in practice," she said in her testimony. Bair called for removing limits on the FDIC's ability to take enforcement action. Bair defended WaMu's resolution, saying it "went remarkably smoothly." All of WaMu's deposits were preserved, bank branches were left open, many jobs were saved, and there was "a seamless transition for WaMu's customers the day after the bank was closed." Further, the resolution came at "zero cost" to the deposit insurance fund, and the bank was not bailed out. "Had the FDIC been forced to liquidate WaMu, the FDIC estimates that it would have suffered approximately $41 billion in losses," she testified. The FDIC has acted to implement findings of the FDIC and Treasury inspectors general in connection with the oversight of WaMu, Bair said. The two inspectors general identified problems with the interagency agreement that limits the FDIC's ability to examine potential risk at insured deposit institutions. They also expressed concerns about FDIC's reliance on the rating system it uses for setting insurance premiums for banks. Former OTS Director John Reich tried to defend his agency's regulation of WaMu, saying that the FDIC had agreed on the bank's risk rating. Some exam results indicated that the WaMu deserved its relatively high rating until 2008, he said. Reich said he did not why it took so long to implement a Memorandum of Understanding that OTS entered into with the bank under which WaMu was supposed to correct problems. "I regret that there was a six-month delay," Reich said. "I regret that it took so long." But he said he could not remember why it took so long. "I was not personally involved in the negotiations" of the memorandum, he said.